Voor een wending van de typische stadstour dompelt u onder in het Rome van 'Angels and Demons', de bestseller van Dan Brown. Geïnspireerd door het boek neemt dit sightseeingavontuur je mee op een speurtocht door de Eeuwige Stad, het spoor volgend van het geheime genootschap dat bekend staat als de Illuminati. Onderweg ziet u de topattracties van Rome, zoals het Pantheon, de Sint-Pietersbasiliek, Piazza Navona en Castel Sant'Angelo. This was a pretty weak, disorganized tour. Our tour guide whose name I can't remember was pretty checked out. It almost felt like he was doing this tour against his will. Don't get me wrong: He knew a lot about the subject matter not the book/movie so much, but definitely about the history. He was just a real bummer to be around for three hours. As someone else mentioned, this tour involves a LOT of walking...and you don't necessarily follow the book/movie as it occurred. Given the logistics of it all and how far apart the locations are spread out, I can understand why the tour is given this way. However, as someone else who reviewed this tour mentioned, one of the sites that we were supposed to visit was temporarily closed. So, we went there, saw that it was closed, drove to one of the other locations, then drove back to the closed location. It makes for a lot of downtime in between, and a lot of unnecessary driving/walking. And, really, it would have been great if he'd checked out the sites beforehand to make sure that they'd be open at the time that we'd be visiting them. I honestly can't recommend this tour. You'd really be better off visiting the sites on your own, at your own pace...maybe over the span of a couple of days. Our Guide Vittoria was fantastic! Very accommodating. It was just my group and some had to walk slower than others. She did a great job making sure we were always together. She was very soft spoken so I would recommend a head set for the group. It was hard to hear her when we were walking. This was FOR SURE a walking tour. Pretty much NON-STOP walking for 3.5-4 hours so just me ready for that! Chiara was absolutely amazing - we felt like we were with a friend and not a generic tour. Good information about all the sites. Highly recommend. This tour was AMAZING! We set up this tour for the morning time on the day we flew out from Rome. Flaminia was our tour guide and is the best we have ever had! We have taken several day tours around the world and this was the most fun we have had. It didn’t feel like a tour but like we were family! Tour guides were knowledgeable, but this should have NEVER been a walking tour for people our age, and there is no way it should have been offered on a Sunday, when churches are closed for mass! Advertise it correctly as a WALKING tour! Don't offer it on a SUNDAY! Also, you should have some sort of diagram for the participants on how it all fits together. And, the timeline was skipped as part of the tour. We learned afterwards from a later guide that it the timeline was near our first stop. It was cool to see the sites we saw in the movie. My fiancé read the books so he really enjoyed this tour. we were picked up from our hotel but not dropped back off. Our tour was changed to the late afternoon so we had to figure out how to get back to our hotel from the Vatican at night. I can't even begin to tell you how bad this tour was. Do not waste your time or money! First, I had this tour scheduled for Friday morning at 9:30 am. I was contacted on Wednesday afternoon to reschedule for Thursday morning, which was impossible since we did not arrive until Thursday at noon. Then on Thursday, I was contacted if we could reschedule for Saturday morning, which we could not. We had another tour already scheduled for Saturday morning. We only had a short time in Rome and I had specifically scheduled out each tour for maximum time. We were told that Friday was not possible, so therefore we were left with only Saturday afternoon for the tour, since we were leaving on Sunday. We felt like we didn't have a choice at that point and we had one person in a group that is a huge Dan Brown fan, so we wanted to do the tour. We were picked up at 3 pm at our apartment on Saturday afternoon in a van. We had to go pick up another group of 4 and then they split us up into two vans, 4 in each. The van we were in had a terrible smoke odor. The first church we went to was holding a wedding and we could not enter, so we got back in the van, then the second church we went to was also holding a wedding and we could not enter the church. My husband at this point said are we on the 4 weddings and a funeral tour. HA! So for the first hour and a half, we were in a van in traffic going place to place that we could not even enter. When we finally went to St. Peter's square, my husband and I just left the tour. I was so over it. My aunt and uncle, who is a huge Dan Brown fan, continued on the tour, until it got to the point that they still had not seen everything scheduled for the tour by 6:30 pm and asked to be taken back to the apartment. It was a huge disappointment! I feel like if they had left our tour at 9:30 am on Friday morning like originally scheduled then we would not have run into all the weddings and could have possibly had a better tour. This was THE best tour i've ever been on. 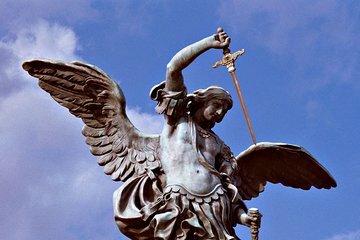 Having never been to Italy and a huge fan of Angels and Demons, I came across this tour with Viator. I read through the reviews and seeing such a positive rating, I decided to give it a try. WOW! It was over 100F that day and although our hotel was outside of the pickup zone, they sent a car to get us. They also drove us to three of the points of our tour to keep us from melting, which made it so much more enjoyable. I do not think we could have survived walking for 4 hours in that kind of heat. Our guide, Victoria, was not only knowledgable about the movie but extremely enthusiastic about sharing all of the secrets with us. Her ability to make it an interactive tour where we had to find the angels and identify the elements at each destination made it so much fun. It became a game of sorts and a who can come up with the answer first!. Her knowledge of Rome and the extra history bits she shared along the tour are pieces of knowledge we never would have gained doing it on our own. Absolutly LOVED this tour and would ABSOLUTELY recommend it to anyone coming to Rome. Thank you Victoria for an amazing experience I will never ever forget! My daughter and I went on this tour. We were met by our guide, Angelica and a driver at our hotel. They took us to the Pantheon and we then began our tour. It was amazing. There was a good bit of walking, but the time went by so fast as we attempted to find the clues. Along the way we learned many things about Rome that we would not have otherwise known. Our guide was friendly, courteous, energetic and fun. This was my third trip to Rome and I believe I learned more about Rome.....and of course, Angels and Demons..... than I had learned in my earlier trips.. A very educational, fun and pleasant day with a very informative tour guide. I was impressed and pleased. I recommend this tour!